Rated 5 out of 5 stars.30 total votes. There's so much you can do with an understated wooden tray. 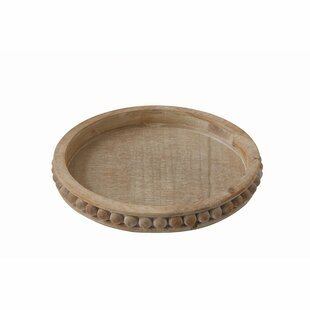 This circular design is crafted from solid wood in a rustic brown hue, and features a carved bottom. Whether you're displaying nautical accents like balls of rope and jars of sea glass on your console, corralling napkins and plates at a party, or serving up a tray of tasty treats, this versatile piece has you covered. Measures 16'' W x 16'' D x 2'' H.
Overall Product Weight: 2.068 lb. Feed your design appetite with this Serving Tray. Combination of natural wood and black finished metal satisfies your industrial farmhouse style. Serve up refreshments to your guests or place it on a coffee table with decor for chic appeal. Overall Product Weight: 4 lb. Rated 4.5 out of 5 stars.377 total votes. 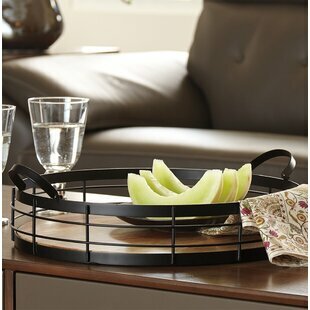 Multi-functional, accent trays can be used in any room. Put them on an entryway table to hold other decorative items or things like keys, use them on the vanity of your powder room to hold soaps or perfumes and such, or use them on a coffee table to hold remotes or serve drinks - their use is endless. This one, for example, arrives in a two-piece set, that is perfectly at home in country cottage inspire aesthetics. Rated 4.5 out of 5 stars.248 total votes. Overall Product Weight: 2.6 lb. Rated 4.5 out of 5 stars.1164 total votes. Rated 4.5 out of 5 stars.713 total votes. Showcasing the combination of metal and wood, this handled tray evokes the reclaimed aesthetic of industrial spaces. Overall Product Weight: 3.86 lb. Rated 4.5 out of 5 stars.270 total votes. Chic, sleek, and swimming in style, this glamorous vanity tray instantly elevates your accessories with glamorous appeal. Crafted of tubular steel in a rich satin gold finish, the tray’s frame strikes a rounded rectangular silhouette measuring 11.02" W x 15.75" D x 2.52" H overall. The reflective mirrored glass tray puts cosmetics, bangles, and bottles of perfume on display, slender side rails keep the tray’s contents in place, while raised handles make transporting the tray a breeze. Overall Product Weight: 4.07 lb. 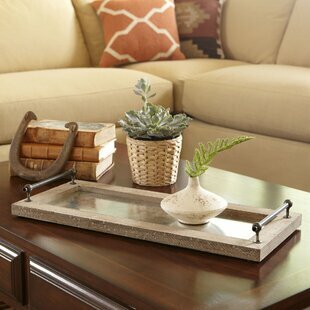 Catch keys and accessories in the entryway or mail in the kitchen with this lovely acacia tray, featuring a curved design. Rated 5 out of 5 stars.10 total votes. This product is absolutely unique and no two will ever be the same. Subtle differences in original markings, nail holes, stains, chips, breaks, and splits give these boxes an authentic look. Can use this Susie Glass Vanity Tray as bathroom storage makeup organizer cosmetic organizer or jewelry organizer or display in home or office organizer. All of the farm fresh rustic you can handle in an absolutely delightful size! Each tray is absolutely unique and no two will ever be the same. Subtle differences in original markings, nail holes, stains, chips, breaks and splits give these trays an authentic look. Please see the pictures for further details! They use washes as opposed to straight paint as this helps capture all of the character of the underlying wood, not cover it. Overall Product Weight: 1.32 lb. Rated 5 out of 5 stars.106 total votes. The “Tangier” champagne finished tray will add warmth and style to any gathering. Beautifully etched with a design inspired by Moroccan art, this tray makes a decorative statement in your home. Ideal for serving a round of cocktails or offering hors d'oeuvres at a party, this versatile tray is also perfect for home decor. Overall Product Weight: 2.5 lb. Rated 5 out of 5 stars.183 total votes. Stylist's Tip: Trays are a stylish solution for serving up fresh beverages and hors d'oeuvres, but they're also a transformative decor staple. Let this streamlined design corral vanity essentials in style, or use it to display lush potted plants for a garden-inspired etagere vignette. Crafted from metal, it features a round silhouette and two handles all finished in galvanized zinc for a rustic twist. Measures 26.75'' W x 11.81'' D x 4.53'' H.
Overall Product Weight: 3.45 lb. Rated 4.5 out of 5 stars.199 total votes. Mix up a strong manhattan tonight on your Foreside Manhattan Serving Tray. Dark and chic this metal tray is circular with metal handles for easy portability. Show off your mixology skills at your next party with your new tray. Rated 4.5 out of 5 stars.27 total votes. Rated 5 out of 5 stars.311 total votes. Give antique perfume bottles a worthy home atop your vanity or simply anchor your dining room centerpiece with this eye-catching tray. it pairs an openwork metal frame with a distressed glass center for a dash of dimension. Its free form shape is more artful than traditional, so it's sure to stand out no matter where you set it. Not safe for use with food. Overall Product Weight: 5.3 lb. Rated 4.5 out of 5 stars.554 total votes. When decorating your home, it’s always considered a touchdown when something is both fashionable and functional – like this decorative tray for example! Two handles offer easy mobility, and give you a hand when carrying various household items on this piece. Its weathered finish offers a natural motif to your arrangement, while solid-hued trim gives it a dash of contemporary appeal. Measuring 14'' W x 19'' D x 1.75'' H, it’s the perfect addition to any room in your abode. Overall Product Weight: 3.5 lb. Rated 5 out of 5 stars.57 total votes. Wow!! What a great tray! It is 38" long and would look great on your coffee table, extra-large ottoman or centered on your bed at a slight angle with a book small flower vase and special coffee cup. Rated 4.5 out of 5 stars.135 total votes. This Octangular Design Mirror Vanity Tray features a chrome finish and an attractive design to add the right touch of elegance. Fits easily on a bedroom dresser or bathroom countertop and is a perfect place to store your perfumes or guest toiletries. Rated 4.5 out of 5 stars.62 total votes. Cosmetics display with a rectangular design and wooden accents. Also perfect for on-the-go essentials in the entryway or a charming display of pillar candles, antiqued curios and a sleek vase of timeless tulips. Overall Product Weight: 0.84 lb. Overall Product Weight: 6.1 lb. Rated 5 out of 5 stars.28 total votes. Trays are often thought of as tools to serve, but this one is all style. Crafted from metal, its frame is finished in gold for a glint of glamour and takes on an elongated hexagons silhouette. A mirrored base adds extra depth and dimension, making it especially suited for more traditional aesthetics. Measuring 26'' W x 8'' D x 2.25'' H, it's perfect for perching atop the dining table or entryway console. Not safe for food. Rated 4.5 out of 5 stars.94 total votes. Rated 5 out of 5 stars.20 total votes. Modern button round wood-finish MDF tray with concentric circles of small, flat multi-color mother of pearl buttons inlaid on lacquered bottom, an inside rim with walnut finish and cut-out opposite handles. Overall Product Weight: 1.76 lb. Share your heartfelt sentiments with this beautifully Marquand "Love Lives Here" Coffee Table Tray. The distressed wood finish gives the design a rustic quality, yet the metal side handles add a contemporary touch making it blend easily with all interiors, from traditional to modern. Imprinted in white is the phrase "Love Lives Here" and is sure to let family and guests know you care. Overall Product Weight: 1.65 lb. Rated 4.5 out of 5 stars.153 total votes. Multi-functional, accent trays can be used in any room. Put them on an entryway table to hold other decorative items or things like keys, use them on the vanity of your powder room to hold soaps or perfumes and such, or use them on a coffee table to hold remotes or serve drinks - their use is endless. This one for example, is perfect for outdoor and indoor use, in a traditional aesthetic. Crafted of metal, in a round shape, this accent tray is food safe. Rated 5 out of 5 stars.42 total votes. Bring modern design to your home with this lovely Hepner Hexagon Vanity Tray. Place this charming tray on your entrance console table as a trinket tray to hold your keys and sunglasses as you come and go. This tray can also be used as a decorative accent on an ottoman to hold your beverages or on your vanity for makeup organization. Bring a chic and glamorous decorative accent into your home with this dazzling tray. Rated 5 out of 5 stars.146 total votes. Lend a pop of Hollywood regency-chic to your aesthetic with this round mirrored accent tray – perfect for serving highballs and coups of champagne or corralling perfumes and lotions alike. Crafted of metal, this tray’s frame strikes a circle-shaped silhouette featuring openwork trellis walls finished in antique bronze and silver leaf. Inside, the tray is lined with mirrored glass featuring a flat, non-beveled edge for a brilliant reflection, letting its contents take center stage. Rated 5 out of 5 stars.60 total votes. An even mix of fashion and function, this round serving tray brings a bit of breezy style as it provides a place for keys, magazines, and more. Teeming with texture, this food-safe piece is woven from rattan in a neutral hue for an airy and coastal look. Two handles make it easy to transport trinkets or snacks between rooms, while this design’s raised sides help your things stay put. Measures 18'' W x 18'' D x 3'' H.
Rated 4.5 out of 5 stars.42 total votes. This beautiful serving tray is made of lightweight melamine which is perfect for display or serving your guests. The Sqaure Simple Lines Tidbit Tray by Corelle is a little bit narrow which will be good if you are serving a guest or two. Contemporary pattern with sweeping black lines against a white background. Artifacts Trading Company's hand woven trays and baskets provide the perfect accent to any room in the house with a tight weave, durable construction, with exquisite and impeccable quality. Products are handmade and each piece is unique therefore slight variations and imperfections exist. Artifacts Trading Company manufactures a great line of rattan items for your table and home. Wipe clean with a damp cloth. Rated 4.5 out of 5 stars.54 total votes. 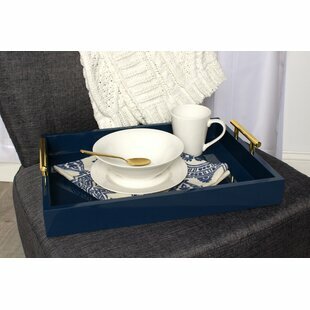 Serve breakfast in bed or treat your guests to some delectable appetizers with this durable tray featuring handles for easy transport and a stylish, sleek look that is perfect for any table setting. Overall Product Weight: 3.2 lb. Rated 4.5 out of 5 stars.429 total votes. From providing a platform for staging a stylish display to helping your surprise a loved one with breakfast in bed, serving trays are a must-have for your home collection. 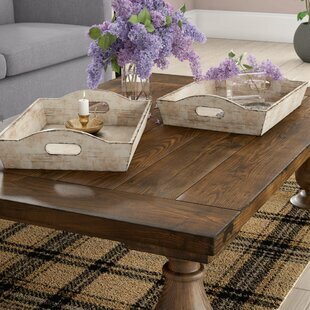 Take this one for example: showcasing a solid and manufactured wood construction awash in a distressed brown finish, this one is the perfect pick for any modern farmhouse setting. Plus, it includes two rope handles for easy transport. Since it is not food safe, we don’t recommend placing tasty treats directly on the surface. Rated 5 out of 5 stars.332 total votes. Trays certainly aren't just for serving! Take this one for example: not designed to carry food and boasting a stylish design, it's perfect for staging a vase of vibrant blooms or just corralling jewelry atop your vanity. Taking on a circular silhouette measuring about 13'' in diameter, it pairs a steel frame finished in polished chrome with a mirrored base. Offering a glint of glamour, this piece is an ideal fit for both classic and contemporary settings. Overall Product Weight: 3.3 lb. Rated 4.5 out of 5 stars.98 total votes. When decorating your home, it’s always considered a win-win when something is both fashionable and functional. Take this two-piece tray set for example: Crafted from solid wood, it features a rectangular silhouette that comes awash in a neutral hue, blending effortlessly with your existing color scheme. Not safe for food, this decorative set is ideal for showcasing some favorite china, faux flowers, and more, while the two varying sizes lend visual contrast to your space. Rated 4.5 out of 5 stars.109 total votes. Overall Product Weight: 0.7 lb. Rated 5 out of 5 stars.21 total votes. Bring sleek style and a touch of modern appeal to your decor display with this lovely accent tray. A chic update on classic style, this accent is crafted from metal with a circular mirror base. The open frame loop rim with a dark brown finish adds artful appeal to this look, while the mirror doubles the impact of your decor. As versatile as it is stylish, you can use this tray as a tabletop accent or to serve cocktails at your next party. Overall Product Weight: 5.7 lb. Rated 5 out of 5 stars.23 total votes. Overall Product Weight: 3.54 lb. Rated 5 out of 5 stars.18 total votes. This set of elegant Hazeltine Rectangular Accent Tray will look great in your home. Crafted from plastic with a marbled finish, this accent tray set is sure to retain its beauty for years to come. Place this beautiful wooden tray on the coffee table to showcase a vase of flowers or on the dining table as a centerpiece. The handles are built into the sides, so it's easy to use as a stylish serving try too! Overall Product Weight: 2.3 lb. When decorating your home, it’s always considered a win-win when something is both fashionable and functional. 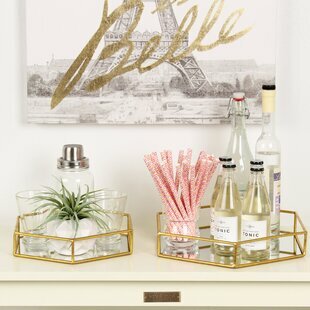 Take this tray for example: Defined by its distressed details and rectangular silhouette, this eye-catching mirrored piece adds a bit of flair to any corner of your space. Its understated design blends effortlessly into both casual and formal aesthetics, while also elevating your space in contemporary style. Measuring 16.5'' W x 24'' D x 2'' H, it fits perfectly into your decor. Overall Product Weight: 9.7 lb. This set of wood square serving trays are perfect when you are looking to be the host with the most. These set of serving trays will add just the right touch to your next get together. These trays make serving tea, snacks, coffee, cheeses, breads, crackers great for parties. The high side walls help keep things on the tray and the handle cutouts make for easy carrying. Made of wood in coated white finish. Overall Product Weight: 7.8 lb. At Wayfair, we try to make sure you always have many options for your home. That's why we have so many decorative trays for sale on our site, including decorative trays from brands like Mint Pantry and August Grove. We want to make sure when you're looking for where to buy decorative trays online, you're getting the one that's exactly right for you, whether that's the Hargrave 2 Piece Serving Tray Set, the Decker Serving Tray, or something entirely different and unique to your home. We have thousands of great deals every day with no need for a coupon. There's never been a better time to "Wayfair my decorative trays".